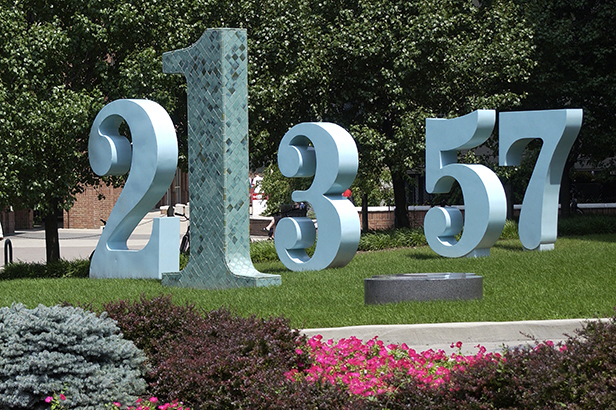 The Ohio State University Department of Mathematics offers students tools for understanding our world and trying to solve its problems. More than ever, mathematicians have an opportunity to make a lasting contribution to society by helping to solve problems in such diverse fields as medicine, management, economics, government, computer science, physics, psychology, engineering and social science. An undergraduate degree in mathematics is an excellent preparation for graduate school in a number of fields including math, statistics and physics. Moreover, it is an excellent preparation for careers in the biological and medical sciences, education, actuarial science and finance. For the last seven years, the Alfred Sloan Fellowship—one of the most prestigious awards given to the country’s outstanding young scientists and mathematicians—has been awarded to faculty members in the Department of Mathematics. The latest recipient, mathematician Matthew Kahle, is an upcoming leader in the new field of random topology. Kahle joins an elite group of Sloan Fellows from the department: Roman Holowinsky (2011), Janet Best (2010), Chiu-Yen Kao (2009) and Jean-Francois Lafont (2008). Professor of mathematics, was selected to receive the 2012 SIAM Prize for Distinguished Service to the Profession. Keyfitz took office as the first woman president of SIAM’s international counterpart, the International Council for Industrial and Applied Mathematician (ICIAM), in October 2011. This award is given annually to a mathematician who has made significant contributions to further applied mathematics on the national level. Professor of mathematics, was awarded the 2012 Leroy P. Steele Prize for Mathematical Exposition for his book, The Classification of Finite Simple Groups: Groups of Characteristics 2-Type, published by the American Mathematical Society. Solomon’s work offers an articulate and readable exposition of the classification of the finite simple groups. Established in 1990, the mission of the MRI is to enhance the ability of Ohio State mathematics faculty members and students to engage in collaborative work in mathematical research worldwide. The MRI provides financial support for speakers in the research seminars; sponsors and co-sponsors conferences workshops and targeted research programs; assists short and long term visitors involved in collaborative research; supports the department distinguished lecture and visitors series; and, encourages the dissemination of the mathematical research. An intensive six-week summer experience designed to encourage motivated pre-college students to explore mathematics. The central goal of the Ross Program is to instruct bright young students in the art of mathematical thinking and to inspire them to discover for themselves that abstract ideas are valuable and important. Students who have never asked why things work the way they do are not prepared to lead the way to future scientific innovation. It is precisely this independence of thought and critical questioning that the Ross Program strives to nurture.